Most people that know me, know that I’m completely in love with my animals. They are just as much a part of my family as any other human member of my family, and they make mine and my fiancees relationship whole. 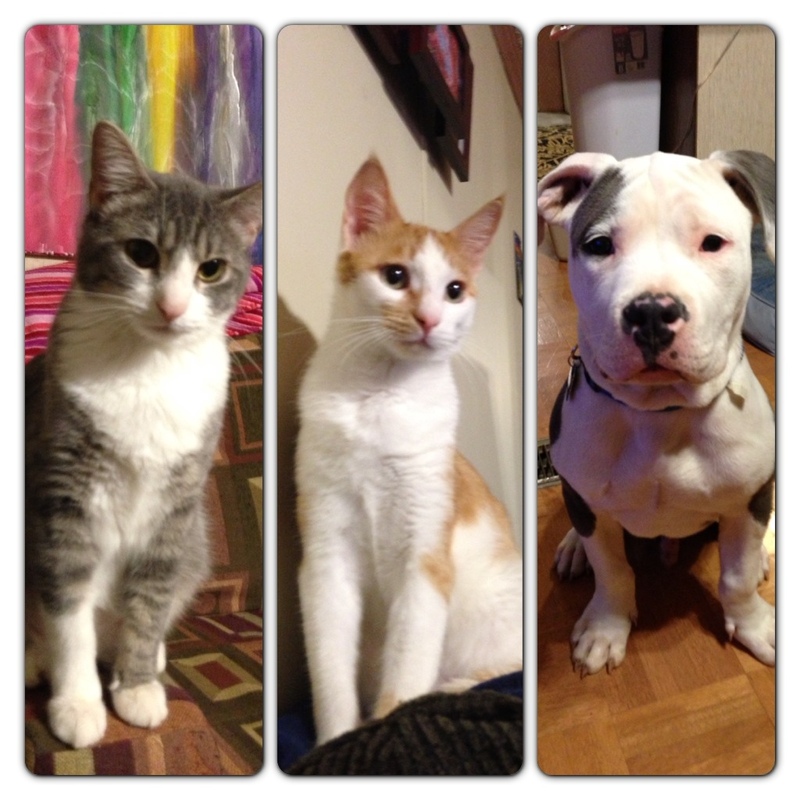 We have two cats, Simon and Booboo and a pitbull named Thor. I could sit here and gush about how much I love my animals, but I will spare you the time and show you what I came up with! This could be perfect for any family, animals are not needed! I plan on doing this everytime we add onto our family (kids in the far future)! Let me know if any of you decide to try this out! It is really fun and so cute. What to do? I first painted the background of the canvas a light tan color, because I didn’t like the bright white canvas. 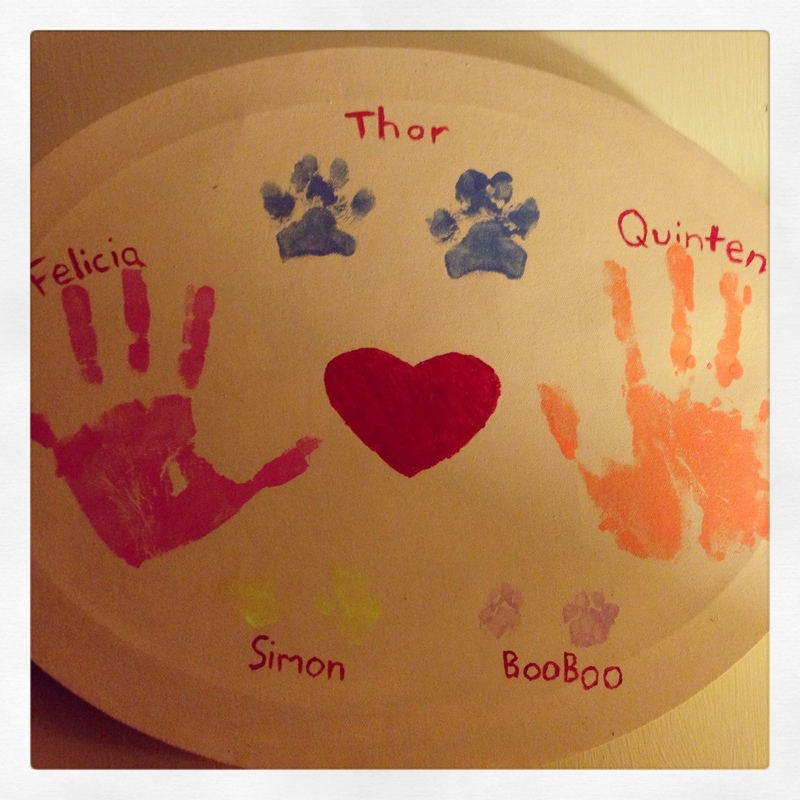 We then painted each of our hands and each of our babies paws and pushed them into the canvas. One thing I must tell you, you HAVE to put pressure behind the canvas against the paw print/hand print or it won’t work properly! I then let that dry, and wrote all of our names and drew the heart! This can be as intricate or simple as you want it to be! I have an obsession with what I call “burrito bars.” Places like Subway, but only they serve burritos! 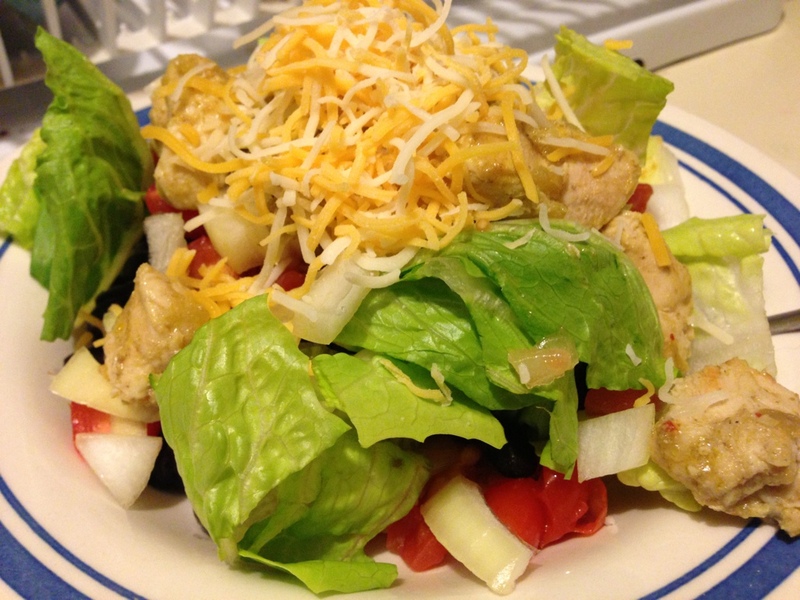 Like Chipotle, Moe’s, Bluecoast Burrito, Flying Burrito…and I love to make my own burrito bowl at home (and it is healthier)! You can add anything to this your heart desires, and I would’ve been much happier if we had some avocados on hand to add to the mix…but we didn’t. 1. 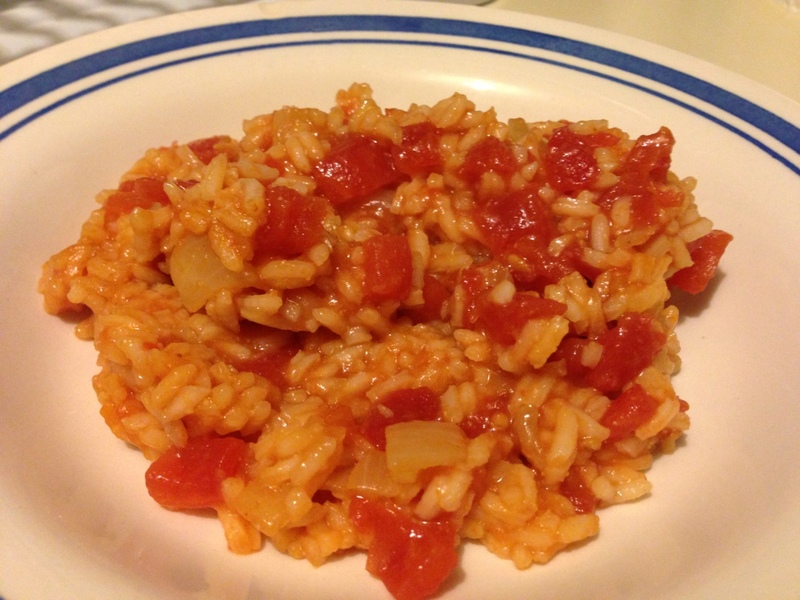 Follow instructions on how to make Clean Eating Spanish Rice. 2. In a medium sized bowl, combine the diced chiles, garlic powder, onion powder, cumin, and crushed red peppers. Mix together. After cubing the chicken, add the chicken into the bowl and mix until the seasoned mixture covers the chicken. 3. 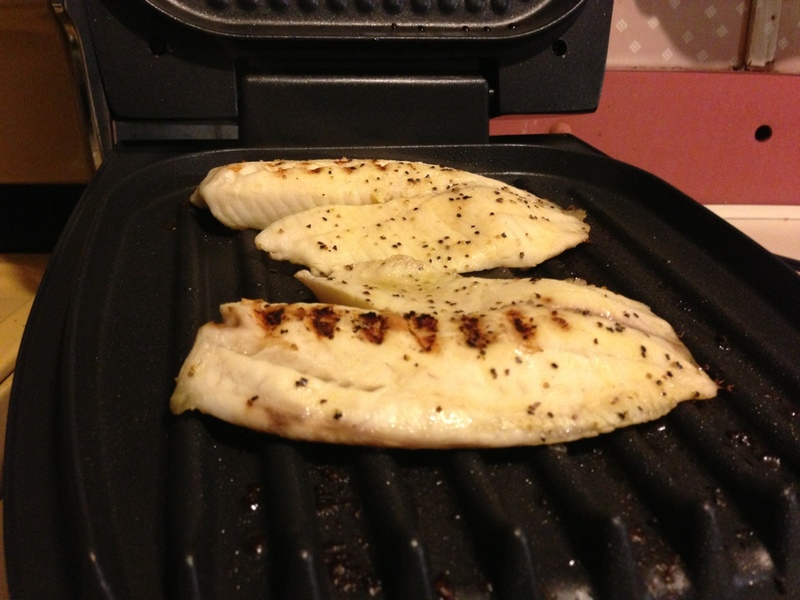 Over medium high heat, add the EVOO and garlic and allow to saute for about 30 seconds. 4. Add the chicken and cook until no longer pink. 5. Add the rice, beans, vegetables, and chicken to a bowl. ENJOY! 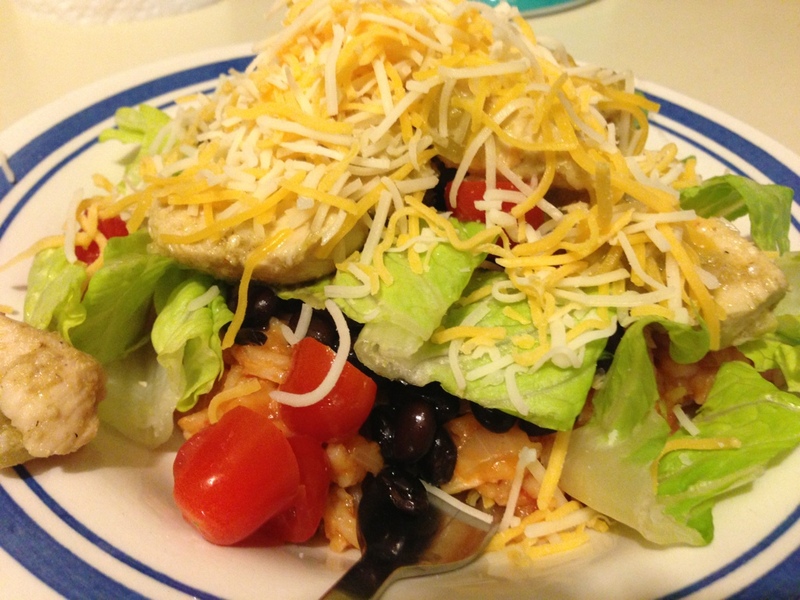 Our burrito bowl this time had Spanish Rice, chicken, black beans, lettuce, cheese, tomato, onion, and salsa! It has been far too long since I’ve posted, and I could give you a long list of excuses as to why I’ve been missing in action but I won’t. Last night, I made some Clean Eating Spanish Rice and thought it was too good not to share, so without further ado, salivate over this recipe. 1. Saute the diced onions, and minced garlic cloves in the EVOO over medium heat until the onion becomes translucent. 2. Once onion is translucent, add in the rice and saute for about 30 seconds. 3. Add in 1 and 1/2 cups of water and bouillon cube (or broth) and the tomato sauce. Bring to boil. 4. Season with garlic and onion powder, turn down to a simmer and cover and cook for about 20 minutes. 5. If after about 20 minutes, all of the juices are gone and the rice is still not cooked all the way, add in the can of diced tomatoes (or you can add this in just to add some tomato chunks, which is really delicious). 6. Allow to cook on low, covered, until the rice is completely cooked through. If you need to add more water, or more broth, do so. I got this idea from Pinterest, of course! My schedule is completely wacko this semester, and I’m taking advantage of any quick meal that I can make. Yesterday, I wasn’t really hungry and the fiancee was, so I made something that he declared “tastes just like a pizza but in a tortilla!” He was so amazed that these were so goods, and they are actually easy enough that he could make them (he ate 4). And, if you’ve got little ones, I’m sure they would love these! 1. Preheat a shallow pan over medium heat. 2. 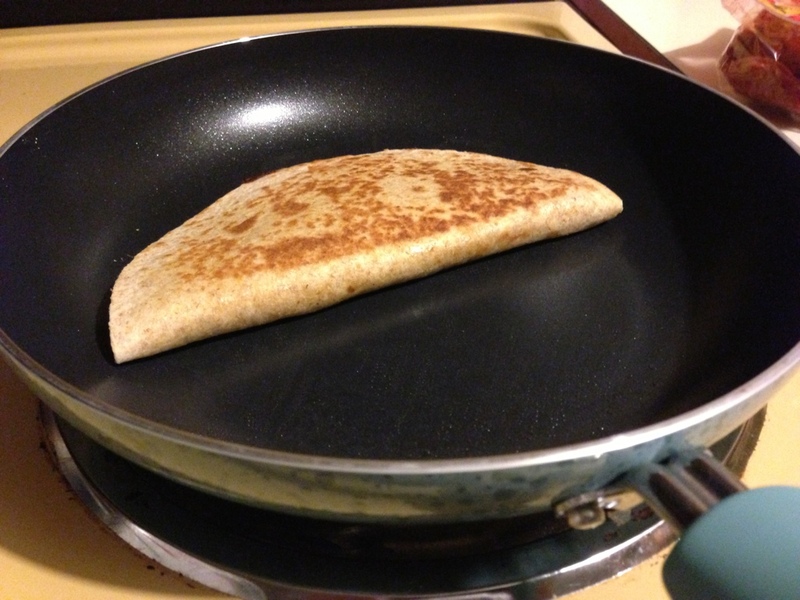 Spread butter on one side of the tortilla, just like you would do a piece of toast. 3. 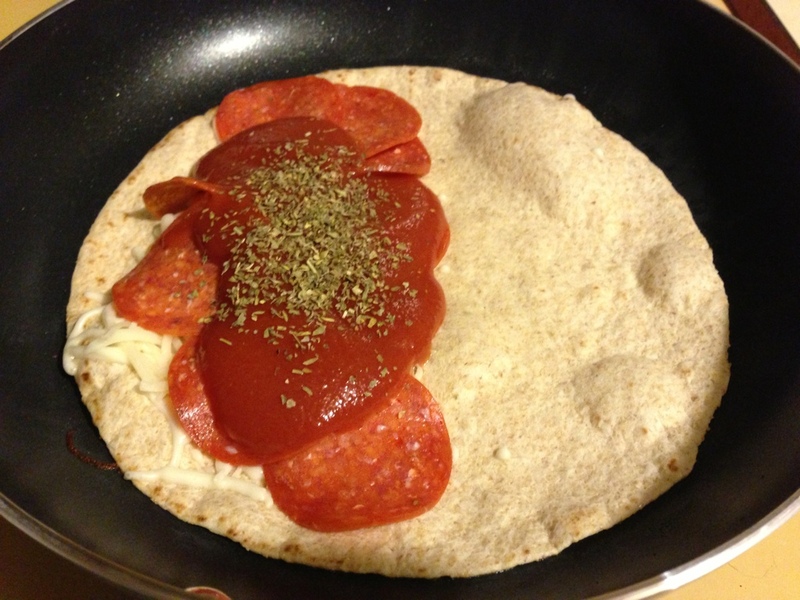 Place the buttered side down in the heated pan, and add cheese, pepperoni, sauce, and Italian Seasoning to one side. 4. Fold the other side up, to look like a quesadilla. 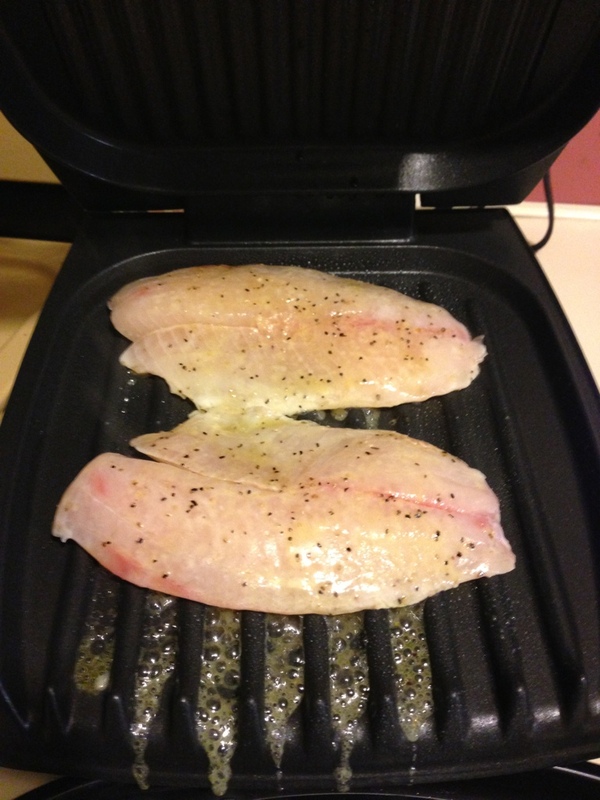 Cook until one side browns, and then flip. Cook until that side browns. You could just dip these in a tomato sauce, instead of putting it inside…it does make it quite messy. But delicious nonetheless. I think next time, I will just dip it in the tomato sauce. Fitness isn’t like a desktop. 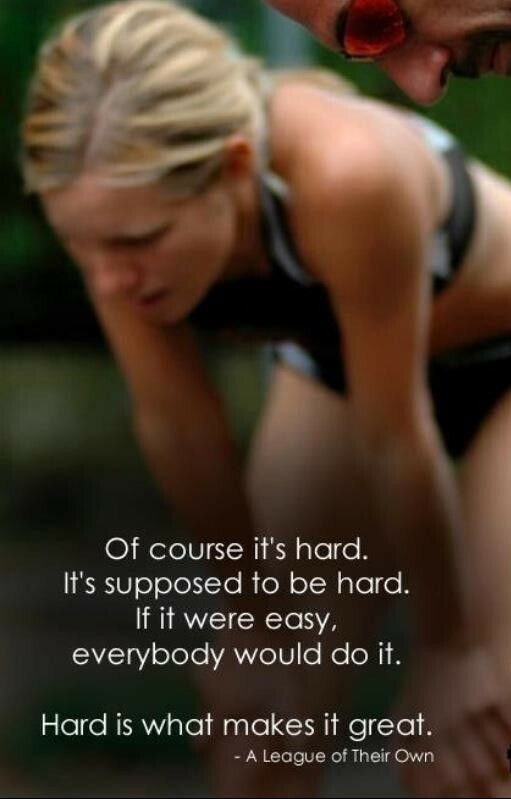 There aren’t shortcuts. Everyday when I get to work, I open up my MSN homepage to check our company e-mail and I always glance through the popular topics that they have. Something about video of fireworks in backwards time, asking a Tiger to get off your furniture (no really, here is the link), and then a link for 14 Shape-Up Shortcuts. You know what? I get it. People don’t want to work towards their goals. They become unmotivated, tired, busy, lazy, etc. But, let’s just be flat out honest – they don’t make their health a priority. If there is anything in life that should be a #1 priority, it should be your health; because, guess what? There are no “do-overs” with your body. You abuse it and you don’t get that time back. BUT, it isn’t too late. It is never too late to start making healthy choices, but I’m here to break your heart…you didn’t get there overnight, so you aren’t going to get that beach body overnight. I’m gonna pause here for the shock and awe to set in. Yes, it is brutally honest. But, it is just that – Honest. There are no shortcuts. Your body isn’t like the desktop on your computer, there are no shortcuts. Period. If you want to be healthy, it is something you have to work with 24 hours a day, 7 days a week, 365 days a year. You have to make conscious effort to eat right, exercise, and put down the third doughnut. Your body is a accumulation of everything you’ve ever ate, and it is going to take time for that to change. I understand that these headlines (because it is plural, it is everywhere – magazines, radio commercials, TV commercials, internet) are more to drag people in, and a lot of these articles actually have good stuff – but, your whole lifestyle has to change. There aren’t shortcuts. You can’t just swear off McDonald’s french fries and expect that to be the shortcut to becoming skinny. You have to change everything about your life! Don’t get me wrong, I’m not perfect and I’ve still got a heck of a long way to go, but if it were easy then everyone would be healthy and fit. You need to make the conscious decision to change your life. There aren’t any shortcuts. Now, quit reading my blog for a second, go take your dog for a walk, play catch with your kids, go running, do jumping jacks, run around your house, I don’t care! Do something. You deserve it. I always tend to have too many potatoes, and need to find a way to hurry up and use them all before they sprout eyeballs. This recipe is my go-to recipe when wanting to clean out my potato stock, because it is not only delicious but pretty much goes with anything. I love eating mine just plain, my fiancee likes to eat them with ketchup, and my dad likes to eat it with salsa. Whichever way you choose to enjoy this dish, it is always yummy. I hope everyone enjoys this recipe as much as I do! 2. In a shallow cooking dish, spray bottom with non-stick cooking spray. 3. 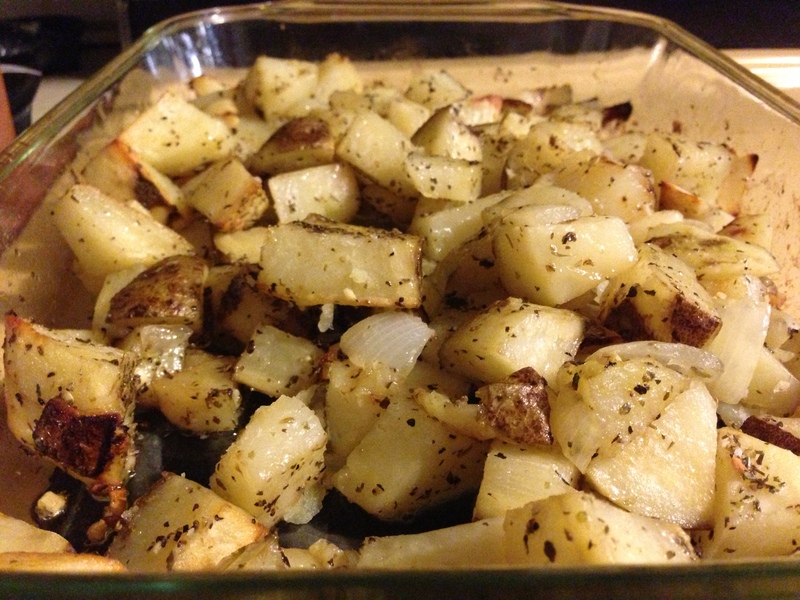 Combine chunked onion and potatoes and drizzle with EVOO. 4. Cover the potatoes evenly with minced garlic, and seasoning. 5. 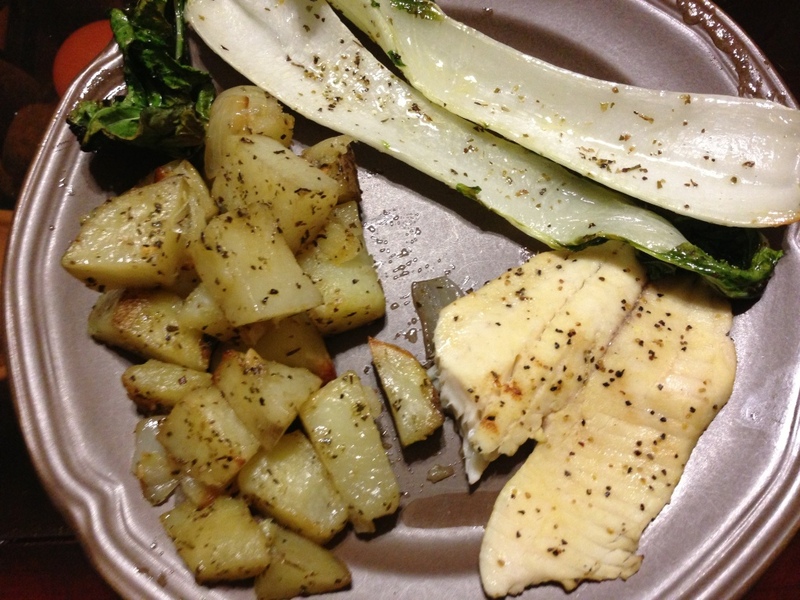 Use a spoon to mix the potatoes together to make sure that they are all evenly seasoned. 6. Cook in oven for about 40 minutes, stirring half way through. When a fork can easily pierce the potato, it is ready.